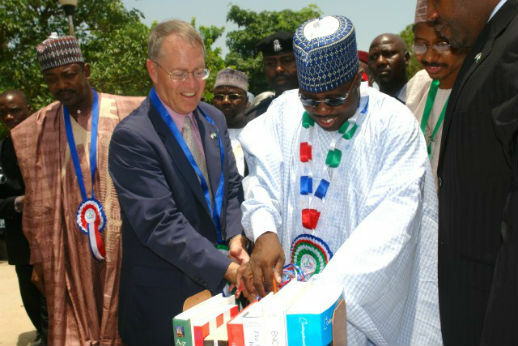 Home » Who is Ali Modu Sheriff? Ali Modu Sheriff was born 1956 to the prominent Borno business tycoon Galadima Modu Sheriff. He was elected Senator representing Borno Central during General Sani Abacha’s military regime. In April 1999, after democracy was restored, he was elected Senator for a second time on the platform of the All Nigeria People’s Party, or ANPP. He ran for Governor of Borno on the ANPP platform in 2003 and won. He was re-elected in 2007. • When Sheriff again became Senator for Borno North in 1999, he helped Mala Kachalla become Governor on the ticket of the ANNP. The agreement was that Kachalla would stand down after one term to make space for Sheriff. • Politicians and Boko Haram members say Sheriff then made a deal with Mohammed Yusuf, an early leader of Boko Haram. If Yusuf provided the support of Boko Haram youth, Sheriff would see to full implementation of Sharia, or Islamic law. • Sheriff took control of the ANNP and forced Kachalla to run on the ticket of Action for Democracy, a small party based in southwest Nigeria. • Sheriff employed thugs under the banner of ECOMOG — not the Economic Community of West Africa Monitoring Group — to intimidate and silence political opponents. • Sheriff became Governor and made Buji Foi, a Yusuf disciple, Religious Affairs Commissioner and through this channel provided funds to Yusuf. • Yusuf used the money to organize micro-credit that gave his disciples capital to set up businesses and they in turn provided financial support to Boko Haram, which then bought arms from Chad. Yusuf’s father-in-law, Baba Fugu, was the supplier. • But Yusuf was not happy about Sheriff’s performance in terms of Sharia implementation after Sheriff became Governor. Yusuf began to direct sermons against Sheriff and his government, ultimately branding him an apostate. In 2007, Buji Foi resigned as Religious Affairs Commissioner in protest. Stephen Davis explained it this way to the Nigerian news website The Paradigm: “It is true that Sheriff fell out with Yusuf and the allegation stands that when the military captured Yusuf in late July 2009 and handed him over to the police in Borno State, he was allegedly executed on Sheriff’s instruction. Thus the root of the perception that Sheriff cannot be a sponsor, but a hated enemy of Boko Haram. But the core of the old Yusufiya is no longer part of Boko Haram. Boko Haram is a mutation of political Boko Haram and Shekau’s Ansaru. In January 2014 a group of Borno State elites calling themselves Borno Elites for Peace, Stability and Progress called for Sheriff’s arrest, claiming he had created terror cells in the state and was connected to a bomb blast that killed about 30 people. No arrest has been made.